When you first step out onto thin ice, and it starts to break, the first cracks are small. Tentative. Then they spider out faster and deeper, but the surface doesn’t out-and-out crack. Then the surface breaks in earnest, and everything caves in. 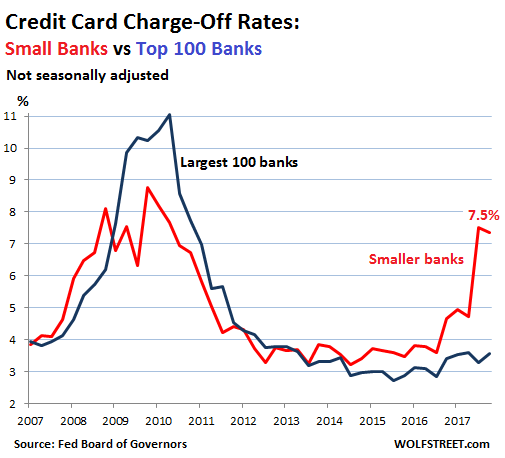 The spike in credit card charge-offs at smaller banks – the most aggressive end of the market – is a first sign that the business cycle has started to turn at the margin. This comes after eight years of the Fed’s easy-money policies. But that era is now drawing to a close. The Fed has been hiking rates and unwinding its balance sheet with clockwork regularity, and with the distinct possibility of speeding up the rate hikes just when – since the Fed is famously behind the curve – the first sign of these credit problems have appeared at the margin: small banks exposed to the most strung-out consumers. From there, credit problems spread to less fragile consumers, and they’ll spread into the corporate sector and into real estate. But banks are still pushing credit cards, and junk-rated companies are still swimming in cheap liquidity. This tells us that the credit cycle will turn only slowly, and that problems will be visible only at the margins for a while – this could be a year or two – papered over by larger numbers and averages. But it seems the Fed is painfully aware that the cycle is turning, that it waited too long, and that it’s time to create some leeway to cut rates later on.